I love food – we know this. Delicious is the language of the world. In every place you could ever possibly go, you can learn the story of its people through food. And each story is different! Today, we visit Spain. In my opinion, Spanish food is the unsung hero of the Mediterranean. You always hear so much about Italian and French, but I don’t think Spain gets as much food play as it deserves. Those Mediterranean flavors we love are still there, but when you add or change some spices and add a few techniques, BAM! You have a whole new level of culinary ecstasy. Allow me to introduce one of the first Spanish dishes I ever cooked (and it was love at first bite) – Pan con Tomate (Bread & Tomato). It is my theory that just as the French invented French Toast as a way to use up stale bread, the Spanish thought of Pan con Tomate. This is actually very common – many favorite dishes and comfort foods come from someone, somewhere needing to figure out how to not waste something. I am SO glad they did! Pan con Tomate is a great way to use up bread you only have a little left of, or that will be too stale to eat soon. It’s also a great way to use up that one or two tomatoes you have left. In a country where we waste almost as much food as we eat, it’s nice to be able to use up something that would normally get thrown out. You know how people rub garlic into toasted bread? That’s all this is but with tomato – all that yummy fresh tomato flesh and juice absorbed into crusty, warm toast. Well, that and its topped with Serrano Ham. I first discovered Pan con Tomate watching a cooking show. It looked so delicious and it was also billed by the chef as a $10 dinner for four. I tried it and fell in love. Then I mentioned it to my bestie and favorite Spaniard, Ana. She showed me how to do it just like they do in Spain. This is literally a 20 minute recipe and if you buy a whole loaf of bread, packet of Serrano and tomatoes, you can get 4 meals out of it. I insist on eating well at all meals, and this recipe is one I have had for breakfast, lunch, dinner and snack. It’s also a great thing to make in bulk if you are having a get together and want to serve a snack or appetizer. You can go from single serving to feeding an army while barely increasing your work load. I like ciabatta and my favorite is from Trader Joe’s. It comes in a gigantic half loaf & the ingredients are just whole wheat flour, water, and sea salt – just like in Europe. You can pick whatever you like, however I would shy away from pre-sliced bread or anything that is too soft. If you don’t have extra virgin don’t sweat it – regular olive oil is fine. Trader Joe’s (again with the Trader Joe’s!) has a fantastic Spanish EVOO for about $8 if you want to go totally authentic. I personally wouldn’t sub other kinds of oil for this recipe as olive oil is a staple in Spanish cooking and changing the oil will take away some of that beautiful flavor. With any recipe using bigger tomatoes I have found you can never go wrong with Heirloom or Tomatoes On the Vine. They are both always juicy, sweet, and have the most flavor. Again – to each their own – get what you like or use what you already have. 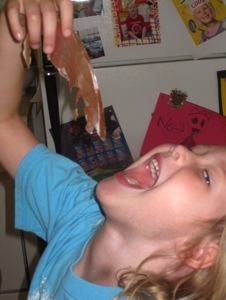 Serrano ham is some of the best-tasting cured meat in the world. Good quality, but also some of the most expensive. Seriously, I’ve seen it in actual catalogs. You can definitely find it at Whole Foods, Nugget or higher end specialty stores. You can also find it online. Now sometimes I am willing to go out of my way or deeper into my wallet, but sometimes I’m not. Prosciutto makes an excellent substitute and it’s a tad cheaper and much easier to find. Both Serrano and prosciutto come VERY thinly sliced and a little goes a very long way. You can find prosciutto at any grocery store. For the best price and quality I buy it at Trader Joe’s (surprise!) and lately Costco – I can get twice the amount there for extremely high quality for about two bucks more than at TJ’s. You could also use a non-pork or non-meat substitute (turkey bacon or veg bacon perhaps), but of course the flavor will change. Brush olive oil on both sides of bread. Grill, fry or toast until golden brown. I usually use a pastry brush, but if you don’t have one don’t sweat it. Just lightly drizzle the olive oil over the bread and then spread it with your finger on both sides of the bread. As you can see in my pictures, I like my bread a tad burnt – it’s my thing and I love it. If grilling, I’d put it over a medium high flame checking it every 2 minutes or so. If you are doing it in a skillet I don’t even bother brushing the oil on – just put it in the pan, the bread will absorb it just fine. Same heat level as the grill. I wouldn’t put bread with oil on it in a pop-up toaster, but you can easily broil it in the oven. Just watch it closely. Lightly rub garlic all over one flat side of each piece of toast. When I say lightly, I mean lightly. This is raw garlic, which is highly-concentrated flavor and a bit of spice. The first time I made this, I WAY overdid this part & could barely taste anything else! 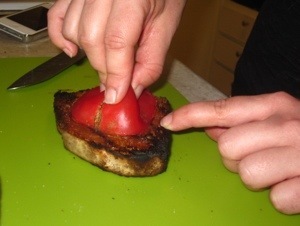 Firmly but gently, press and rub ½ of a tomato into each slice of bread until most of the juices and flesh are absorbed. Sprinkle with a few kernels of kosher salt. It’s the same method as with the garlic, except this time you really want to apply pressure. We want all that juice and flesh to absorb right into that dry toasted bread. Just don’t press too hard; you don’t want to smash the bread. I basically consider it ready when the tomato starts to collapse in my fingers. With the salt, literally a few kernels are enough. This is a dish that will show you the difference between kosher and regular sodium chloride! 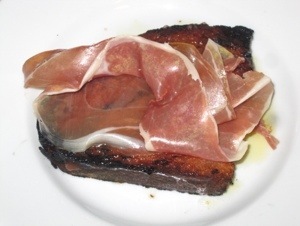 Lay one slice of Serrano ham on each piece of bread. Serve & enjoy! Next week I’ll have a great freezer-friendly vegetarian meal for you!